Sargent Corp. is in the business of digging deep. The company owns a fleet of equipment for moving earth and other heavy loads. Tracing its Maine beginnings back to 1926, the company today is headquartered in Stillwater, Me., and has 400 employees that work in seven states. The company boasts that its workers are led by a field management team with more than 1,000 years of combined experience. But Sargent feels its welding and fabrication shop is its best-kept secret. For more than 40 years, the shop has performed general maintenance on Sargent’s heavy equipment, from diggers and dump trucks to screen plants to fuel and water trucks as well as the numerous attachments, including snow blades, brooms, cutters, tillers and hammers. The shop also assists outside customers, such as the University of Maine, with equipment repairs and new builds. 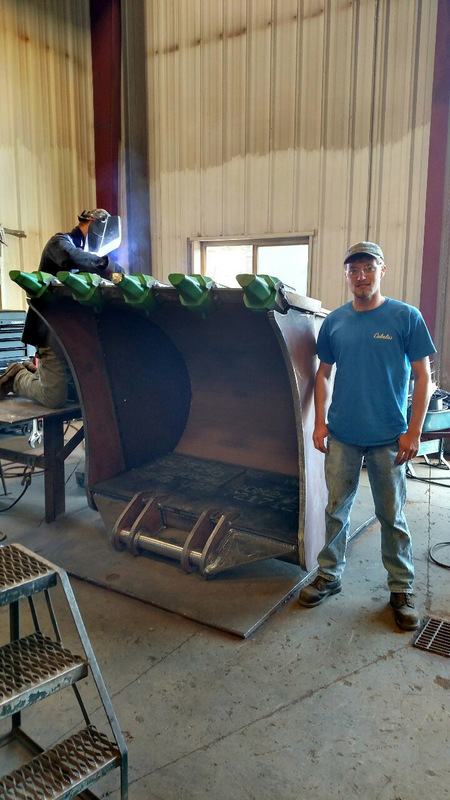 Burn table operator Matt Moon stands next to a completed bucket. Sargent’s shop is also an authorized supplier for Wimmer International, filling hundreds of orders every year for excavator buckets and quick couplers. The 9,600-sq.-ft. fab shop is fully equipped including an 10ft.-by-26-ft. burn table that can cut 3-in. steel plate, a press that can bend 1.25-in. steel plate, two overhead cranes and a workforce of 13 certified welders. The shop has one Hypertherm XPR300 plasma cutting setup on a new Koike Aronson burn table, along with an oxyfuel setup for plate from 1 1/2 in. up to 3 in. They cut a variety of shaped parts from 3 in. to 6 ft. long by 4 ft. wide and up. After cutting, the parts are cleaned and welded together to make the final products. Last year, Sargent produced approximately 290 parts in total in all sizes. The final products require on average between 50 and 120 hours each to fabricate. Sargent invested in the XPR300 to help increase production for the product line, and it’s been trouble-free since the installation. The XPR300 replaced an older Thermal Dynamics Auto-Cut 200 plasma system. The shop also appreciates the resulting cleaner parts that require less cleanup time. When the operator removes the parts from the table, they aren’t stuck together and there is not a lot of dross on them. However, the biggest benefit of the XPR300 for Sargent’s shop so far is that the plasma operator is always well ahead of the other production units. 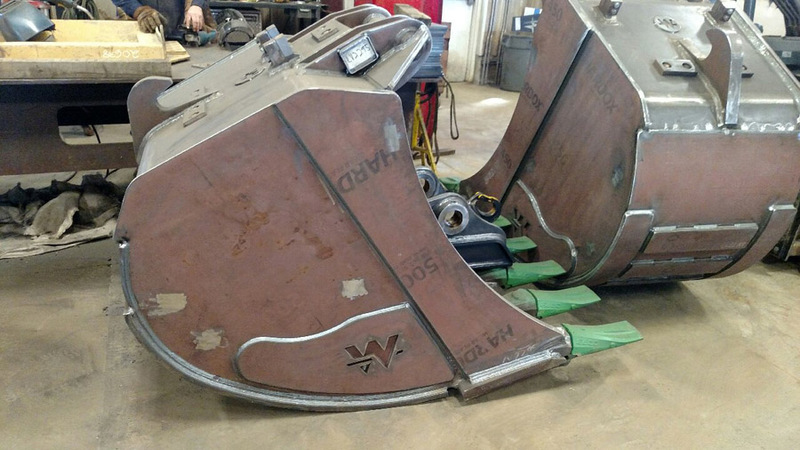 A typical digging bucket produced at Sargent’s fabrication and welding shop. Sargent is an authorized supplier for Wimmer International, filling hundreds of orders every year for excavator buckets and quick couplers. So what does the XPR300 plasma cutting system, along with the more recently launched XPR170, have that allows Sargent to make all of these gains? First, it cuts fast. The XPR300 increases cutting speed, noticeably improving productivity and slashing operating costs. It also uses power more efficiently than earlier Hypertherm plasma systems. The Hypertherm system delivers lower operating costs with increased cutting speeds on thicker materials. Behind the XPR cutters is X-Definition plasma technology, which advances Hypertherm’s industry-standard HyDefinition cut quality by incorporating several completely new technologies with greatly expanded use of HyDefinition processes for next-generation cutting on mild steel as well as stainless steel and aluminum. Laboratory testing shows X-Definition is primarily an ISO range 2 and 3 cutting technology. ISO 9001 measures a cut edge’s deviation from perpendicular and encompasses 5 ranges, with 1 having the least deviation and 5 having the greatest deviation from perpendicular. On mild steel, conventional plasma is primarily an ISO range 4 and 5 cutting technology and high-definition plasma is primarily a range 3 and 4 cutting technology. To reach this point, Hypertherm engineers developed numerous new process technologies delivered through three console options – Core, Vented Water Injection and OptiMix – that each offer high cut quality in mild steel, but with each console delivering successively enhanced cutting capabilities on stainless steel and aluminum. 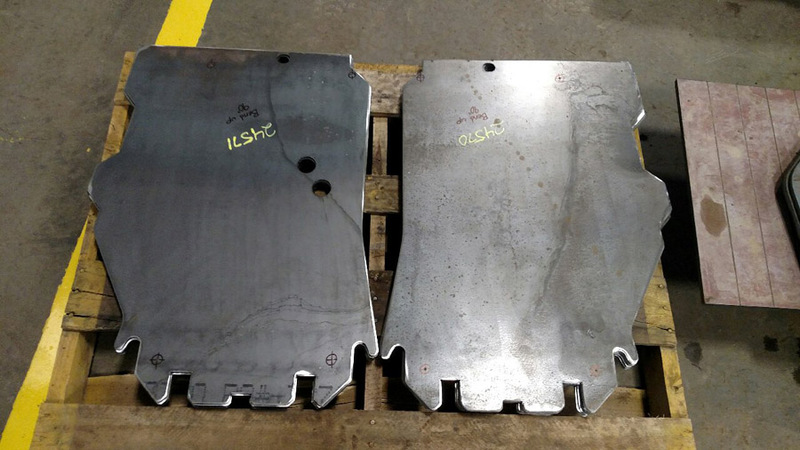 Sargent’s burn table operator cut these parts for a tilt bucket with the XPR300. Arc Response technology protects consumables from the negative impact of ramp-down errors, where an arc terminates in an uncontrolled manner. By controlling the ramp down and reducing the impact of ramp-down errors, XPR consumables can last longer. 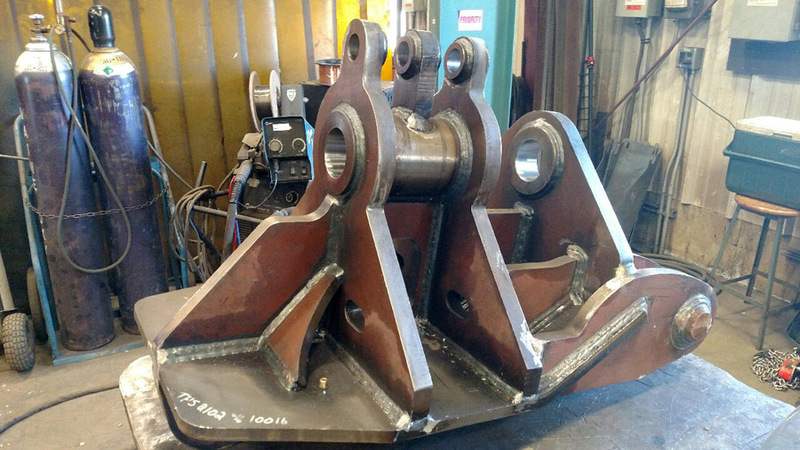 This tilt head assembly for a Wimmer tilt bucket was cut with Sargent’s XPR300. Tying into the intelligence built into the XPR power supply, it can sense what is happening at the torch in terms of the arc voltage or the stability of the current. “We can set thresholds so if the power supply senses that the arc is being stretched beyond a certain point, it automatically ramps down the arc,” Parker says. Despite all of these advancements, the XPR300 is easy to use. The system is designed with fewer consoles and connections. For example, an EasyConnect feature allows the operator to quickly plug the torch lead into the torch connect console without the use of tools. Everything is consolidated into one connection point, where before multiple connection points and hoses were going into the console. Another new design feature is a quick-change torch that enables the operator to rapidly change torches with just one hand. And, while still requiring a tool, the QuickLock electrode delivers quarter-turn tightening to further reduce consumable setup time. 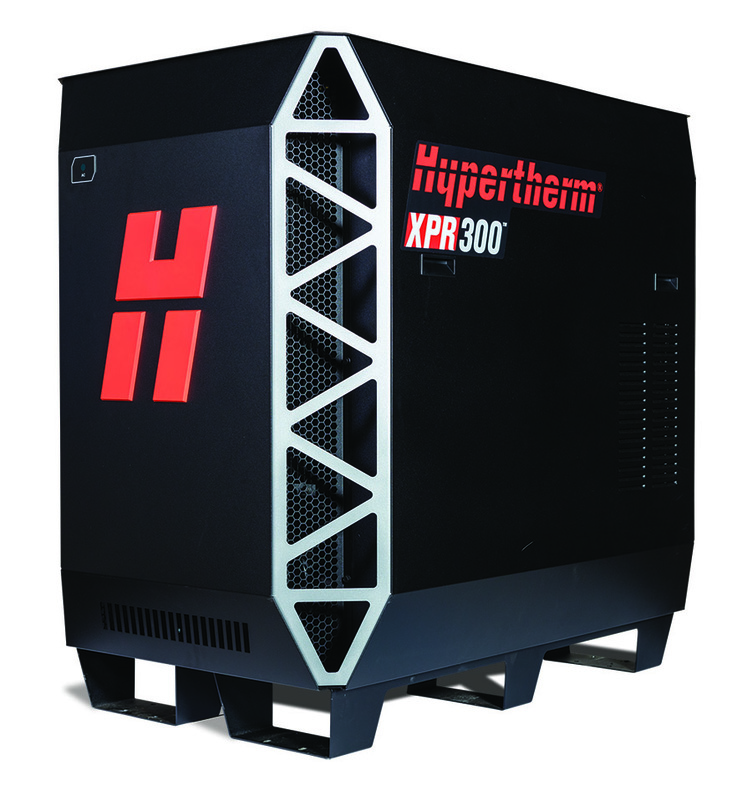 Hypertherm’s XPR300 plasma cutting system offers faster cutting speeds and uses power more efficiently than earlier systems. 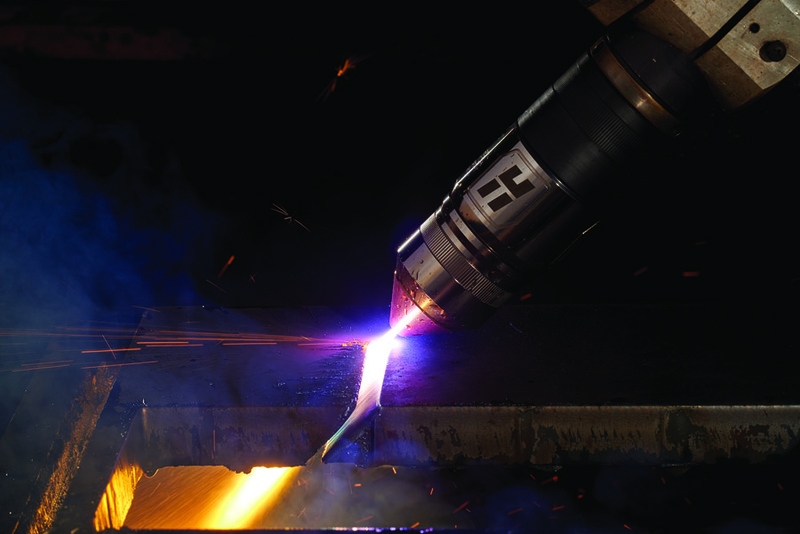 Overall, the arrival of X-Definition plasma technology and XPR300 and XPR170 plasma cutting systems is a huge step forward in the capabilities of plasma technology. The systems offer reduced operating costs with increased cutting speeds on thicker materials and dramatic improvement in consumable life over previous-generation systems. And, the advancements in stainless steel and aluminum plasma cutting open up a range of opportunities for companies by providing high cut quality and consistency with plasma.